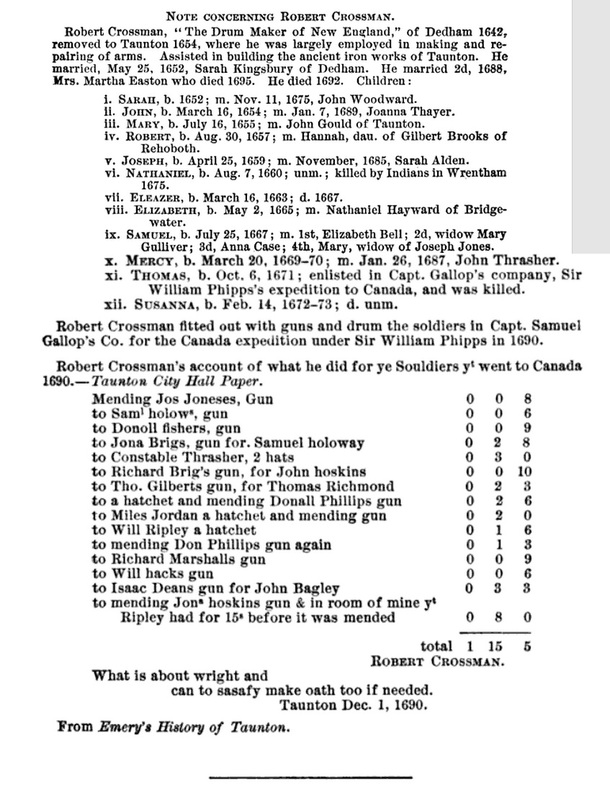 Vital records of Taunton, Massachusetts to the year 1850, Boston, Mass. 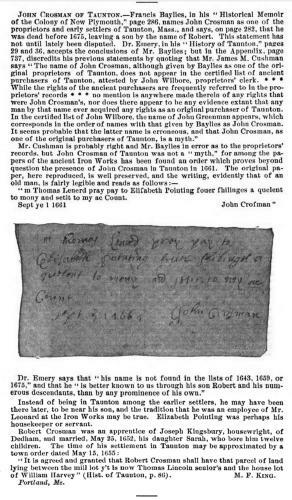 : The New England Historic Genealogical Society, (1929) , p. 109.
http://wc.rootsweb.com/cgi-bin/igm.cgi?op=GET&db=branagak&id=I5000 quotes "Portsmouth, R.I. Records ... "John Crossman, aged about 100 years, departed this life in Newport this 26 th day 11th mo 1687/88." 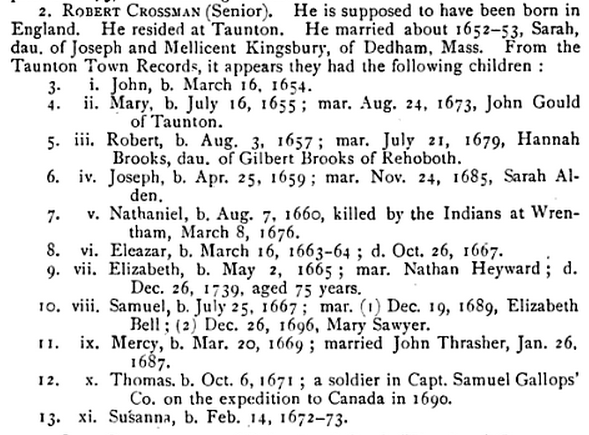 Vital records of Taunton, Massachusetts to the year 1850, Boston, Mass. 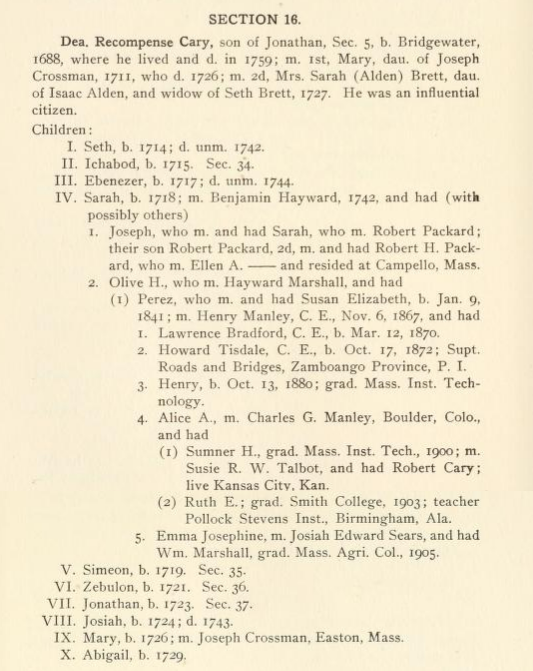 : The New England Historic Genealogical Society, (1929) , p. 110. 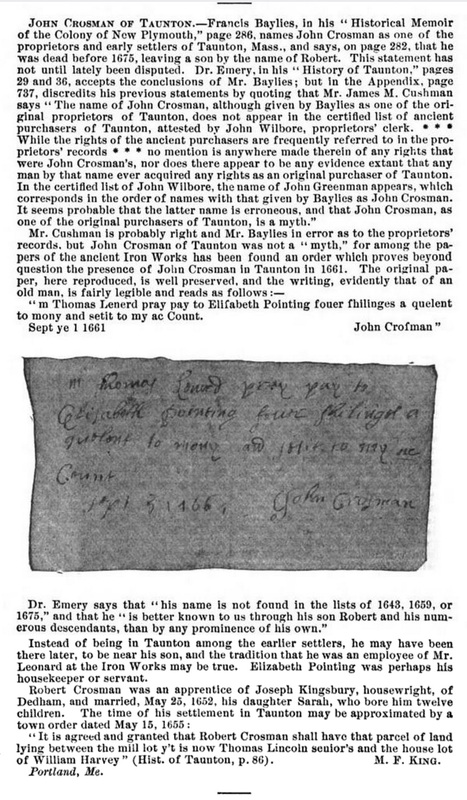 Joseph Crossman of Bridgewater was born perhaps about 1688. 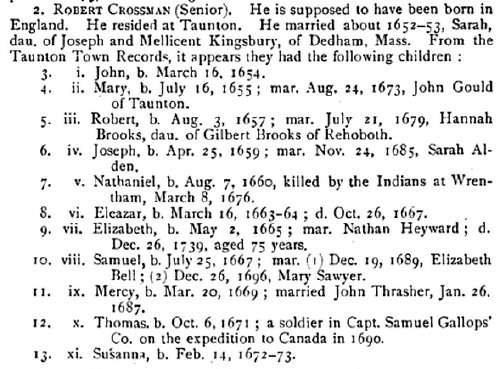 Lydia Crossman of Bridgewater was born perhaps about 1690. 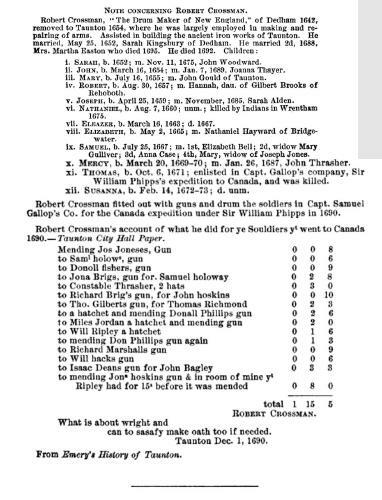 Vital records of Bridgewater, Massachusetts, to the year 1850, Boston, Massachusetts: New England Historic Genealogical Society, (1916) , Vol. 1, p. 87. Vital records of Bridgewater, Massachusetts, to the year 1850, Boston, Massachusetts: New England Historic Genealogical Society, (1916) , Vol. 2, p. 449. Vital Records of Brockton Massachusetts to the year 1850, , at https://archive.org/details/vitalrecordsofbr00broc . Boston, Mass. 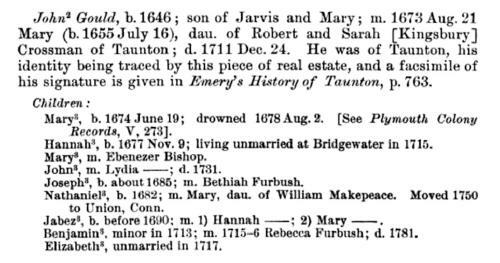 : New England Genealogical Historic Society at the charge of the Eddy Town-Record Fund, (1911) , p. 358. 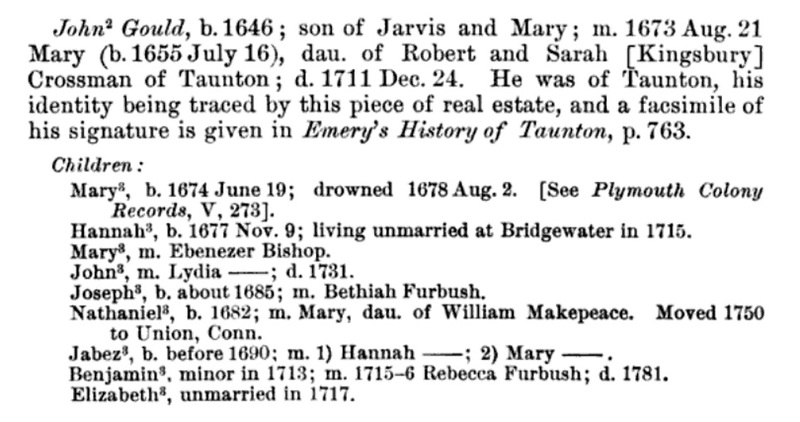 Vital records of Taunton, Massachusetts to the year 1850, Boston, Mass. : The New England Historic Genealogical Society, (1929) , p. 111. 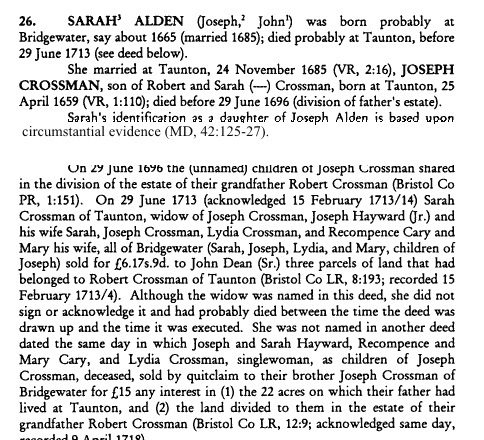 Sarah Crossman of Bridgewater was born perhaps about 1686.